If people want to know where they are, they need a reliable clock. It might seem surprising, but knowing the accurate time is essential for determining position. A major new exhibition, Time and Navigation: The Untold Story of Getting from Here to There, explores how revolutions in timekeeping over three centuries have influenced how people find their way. Among other things, the exhibit recounts the history of satellite navigation, including the invention of GPS and GPS applications. This project is a unique collaboration between two of the Smithsonian's largest and most popular museums: the National Air and Space Museum and the National Museum of American History. 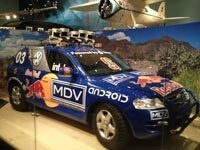 The U.S. Department of Transportation, the National Geospatial-Intelligence Agency, and the National Coordination Office for Space-Based Positioning, Navigation, and Timing co-sponsored the exhibit along with several corporate contributors.